To make wool into felt I begin with cleaned, brushed wool that has been prepared to be spun into yarn. Instead, I interlock the fibers densely together by stabbing the mass repeatedly with a felting needle (approximately four inches long, very sharp, and studded with barbs). In order to shape a piece I stab the wool all over or in particular directions, compressing the surface and making the felt increasingly dense. The process is extremely time- and labor-intensive, as every centimeter of the piece is stabbed to fasten down parts, add mass, and tighten the surface. I choose my subject matter in response to the wool itself, in a way. 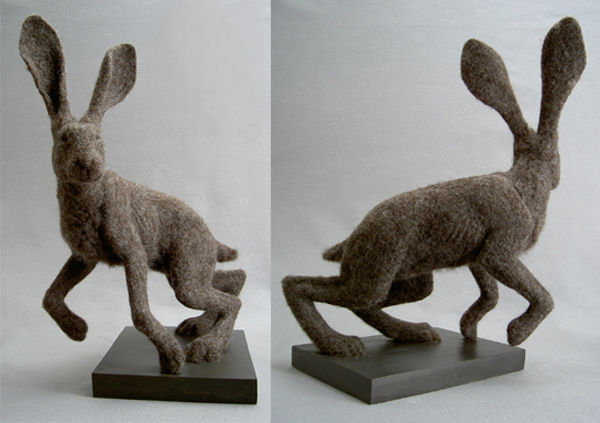 Working with wool has led me to explore concepts of hard and soft, starting within the confines of traditional sculpture subjects. 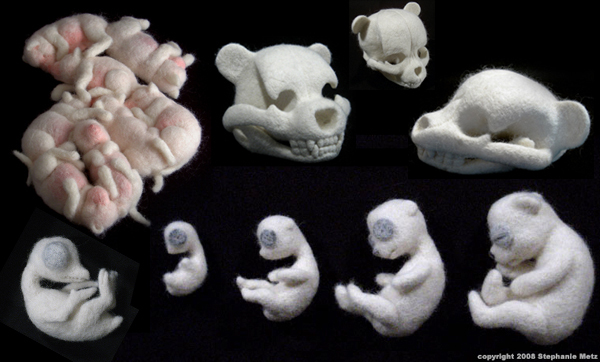 Also check out her mission statement about Genus Ursulus: Teddy Skulls is a pseudo-scientific study of the morphology of skulls of teddy bears here. Ive made some tiny felt sculptures with felting needles and they took *forever*! I can’t imagine the patience and time they took. Amazing. The skulls are my favorites, they’re stunning. what a totally cool, if not creepy, find! Wow! Amazing and beautiful. I would definitely love to see them in person. gross! but awesome! but gross! i cant decide!